The perfect afternoon break ! 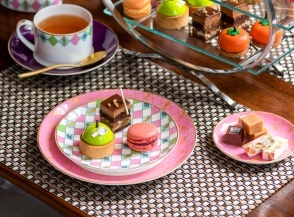 Place Dufferin at Fairmont Le Château Frontenac offers a delicious Afternoon tea inspired by the exhibition including a selection of LOT 35 tea from Metropolitan tea, gourmet open sandwiches, scones served with Devonshire cream and homemade jams, and sweets by our pastry chefs. Afternoon Tea is offered on Saturdays from 2:00pm to 3:30pm.